I hope you like maps. The week after my return to Ruapehu was an exciting milestone in my PhD. It was the first time going to see the volcano that I’ll be doing the vast majority of my work on. We’d had to cancel trips already, but a small window of good weather had opened up at the end of the first week of June, and we decided to take advantage. As I mentioned previously, the days are short right now so if you don’t start early it’s hard to get much done while it’s still light enough to see the outcrops you’re looking for. And with the Taranaki region a 4-5 hour drive from Auckland (about halfway between Auckland and the bottom of the North Island), it would be hard to get there and get field work done on the same day. We remedied this by leaving at 4am (uffa! ), meaning we still had a full day to check stuff out after we arrived. Since we were in a hurry to get down to the volcano (and it was dark for a lot of the trip), I didn’t get to take any pictures of the countryside, but it’s really pretty, and I’ll go back sometime just to look around at a more relaxed pace. Once we got close, sort of as you come around the turn onto the Taranaki Peninsula, we could see Mt. Taranaki off in the distance across the water. I was told this is pretty lucky–many people don’t get any good views of the mountain on their first trip there, especially this time of year. It was quite a nice view. I didn’t take a picture. Then we went closer so I could formally introduce myself (How do you formally meet a volcano? Maybe just find a cool looking outcrop and high-five it? I think I will do that next time I meet one.). Now, according to Maori legend Taranaki was a great being that was brave enough to fight Tongariro (one of the NZ’s other major volcanoes) over the island’s one female volcano, Pihanga, in a great battle. When the battle ended, Pihanga chose Tongariro, so Taranaki moved far away to where it is today (which explains why it off by itself far from the North Island’s other volcanoes). This story is important because it will help you understand just how terrifyingly intimidating our group was when I tell you that as soon as we got closer, Taranaki hid in a cloud and didn’t come out for pretty much the entire rest of the trip. Since we’re on a map binge, here’s one more just to get you acquainted with the landscape surrounding Mt. Taranaki. Pretty cool, innit? Mt. 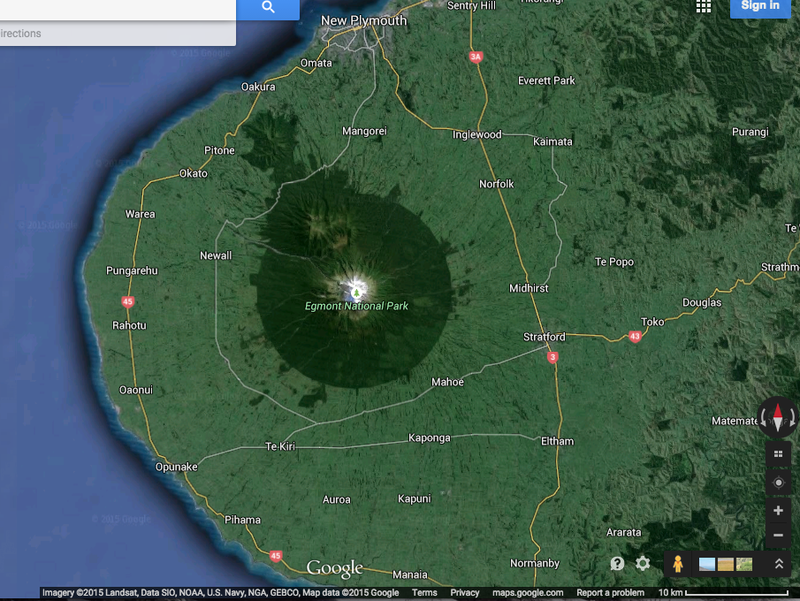 Taranaki is located in the center of Egmont National Park (Mt. Egmont is the volcano’s other name), which forms a near-perfect circle of forest surrounding the volcano. The little bit of dark green extending to the northwest is the lineament on which Mt. Taranaki and all the older, extinct volcanoes that were active before Mt. Taranaki formed lie. The forest stops abruptly at the park’s edge, and lots of farmland begins, full of endless green hills and mounds. Due to weather and time constraints, we decided to leave the higher elevation areas of the park for another time. Instead, we took a tour counterclockwise around the more distal parts of the peninsula (starting at New Plymouth), stopping to see interesting things and planning future trips. Are you ready for some FOOTBAAAALL science? We started by looking at the oldest known deposit from Mt. Taranaki slightly northeast of New Plymouth, called the Motunui deposit, which is likely over 130,000 years old. It’s what is called a debris avalanche deposit, basically it’s a massive amount of boulders and sand and everything in between that came crashing down the mountain when part of the volcano collapsed. Also, it didn’t contain very much water, it wasn’t a mudslide (remember that, because it’s important). We made a stop at another beach farther west to look at the Okawa unit, a slightly younger debris avalanche. After a quick stop in New Plymouth, the region’s (far and away) largest city (~70,000 people) we moved on to the northwestern-most part of the peninsula to see the Sugarloaf Islands. They’re all the remains of the region’s very first volcanic structures from over a million and a half years ago. Our next point of interest was the Stony River (also called the Hangatahua River), one of the largest rivers running from Mt. 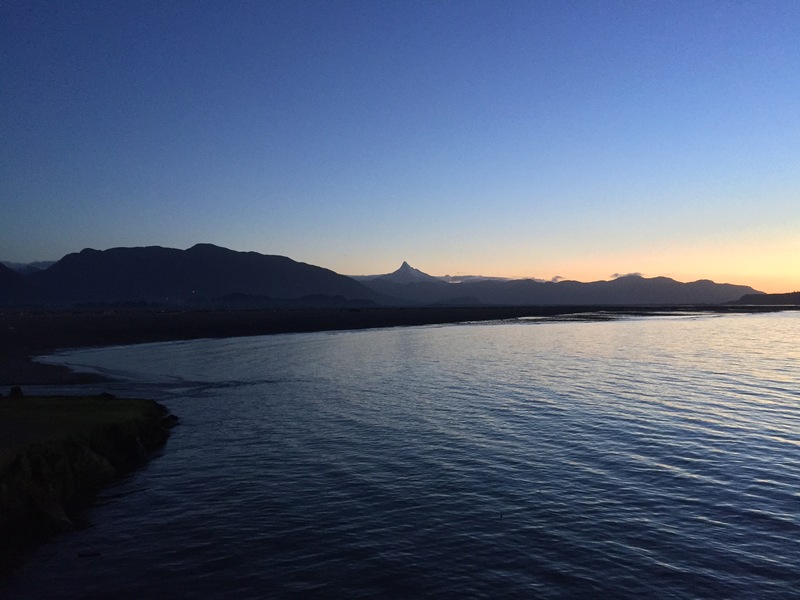 Taranaki to the coast where I will be doing much of my mapping and sampling. Unlike volcanic ash and other explosive deposits which are usually very light and can go anywhere (affected by factors like wind direction), lahars (volcanic mudslides) which I study are mostly driven by gravity. This means that they tend to always flow downhill into and through the lowest areas. That’s why riverbeds are generally the best place to study lahar deposits. Some of the hiking in this area required a lot of bushbashing, a down-under term for forcing your way through dense vegetation instead of taking a trail. There’s quite a lot of forest in Taranaki, so I plan on doing a lot of this during my research. Lots of intermittent rain means lots of rainbows! And at the end of every rainbow is…cows? Then…another trip to the beach to check out another huge debris avalanche deposit. The tide was coming in, so we had to move fast! The next day we continued our tour, driving all the way around the peninsula along the coast from New Plymouth and back around. We stopped at a bunch more potential research sites (which I’m sure I’ll cover in future posts) and got to check out more of the landscape. After all that science, I think you deserve a photo of a volcano. When we had driven around most of the volcano, we decided to drive up into the national park. Unfortunately, it was still really foggy at this point, so we really didn’t see anything. It was a bit disappointing, and we were about ready to drive home at this point. It was a bummer to not have gotten a close-up view of Mt. Taranaki, when suddenly, he mustered up the courage to show himself! So close…almost there…keep moving, clouds, keep moving! Good to meet you, sir. We’re going to be seeing a lot of each other for the next few years, so I hope we can be friends! And then we were on our way back. We’ve already got some good plans for the next trip, so it’s just a matter of finding some good weather that lines up with people’s schedules. Hopefully that happens soon! Awful. Aren’t you sorry you didn’t go to law school?! How long until I get my PhD?